That very evening there was a stormy meeting between Ustad Saheb and his close disciples, wherein the Master publicly scolded those who had failed him so miserably. Instead of accepting their errors and seeking forgiveness, a leading student fought back and insulted the Master using very crude language. Heartbroken, the Master decided to return to Surat and for a full year did not come to Bombay. When he finally came back in March 1924 to attend the Fasli Muktad, the same students who had let him down publicly announced their repentance and drafted an apology letter. However, the damage had been done and Ustad Saheb retired to Surat to spend the remaining part of his life, never to return again to Bombay. Whoever went to visit him was treated to the sight of the Master weeping silently in remembrance of his Master, the Sraoshavarez Marzbanji Saheb, who never again appeared in front of Ustad Saheb. This great grief, coupled with severe diabetes and a painful eye problem reduced the Master to a shadow of his former self. In these difficult times, Behramshah’s close disciple Bahmanshah Hakim was at his side, taking care of the Master’s health and never leaving him alone. We have seen earlier the wondrous circumstances under which Bahmanshah had met with Ustad Saheb and finally succeeded in his quest to have the darshan of Sraoshavarez Marzbanji Saheb Himself . Despite coming from a family of highly distinguished men, Bahmanshah had never concentrated on his studies and had hardly passed secondary school. A short time after his contact with Ustad Saheb and due to his changed lifestyle and rigorous prayers, Bahmanshah realized that the absence of a formal education meant that he could not take up his family vocation of traditional medicine. In his prayers, Bahmanshah beseeched his Ustad to guide him to a Parsi who would teach him basic medicine and the structure of the human body so that he could grasp the basics before actually practicing the traditional medicine which his forefathers had received from the Armenian Khwajah. Dr. Sorabji Dosabhai Desai was a famous physician of that time and a close confidant of Ustad Saheb. Dr. Desai had a very thriving practice in Mumbai and Ustad Saheb would often stay with him during his travels to Mumbai. It was Bahmanshah’s secret desire that he learn the basics of medicine and human anatomy from Dr. Desai. However, Dr. Desai’s busy schedule could not allow for this. 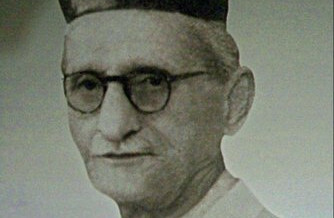 In his interactions with the Abed Sahebs, Bahmanshah was advised to go to Bombay and contact Dr. Framroze Sorabji Chiniwalla, who had recently qualified as an Ophthalmic surgeon and had started his practice at Bhuleshwar in Bombay. Dr. Framroze Chiniwalla came from the famous Chiniwalla family of Surat whose members were well known not only for their great prosperity but also for their very strict and religious lifestyle. His father, Sorabji had made a habit of praying in all the five Gahs of the day since the age of 15 and never missed a single Gah till the day he passed away! His mother and aunts were all traditional Parsi ladies and had given a beautiful and love-filled atmosphere and education to Framroze and his other brothers, Jehanbux, Rustam and Jehangir. Their father had a big shop in the main bazaar in Surat, where in addition to a thriving business, religious men of all faiths gathered for interesting intellectual conversations. This shop was also a favorite spot of Ustad Saheb and he would often be found sitting there in the evening, discussing some intricate topics of religion or regaling the crowd with some interesting tidbits from his varied travels. Ustad Saheb had great respect for Sorabji’s family and traditional upbringing, and would give special attention to his children and their queries. As teenagers growing into adulthood, the four brothers looked upon Ustad Saheb as a role model and a person worthy of awe and reverence. After finishing school, Framroze left for Bombay to study medicine and became one of the few but leading eye doctors of that time. Despite his professional engagements, Dr. Framroze was a regular visitor to the class run by Ustad Saheb whenever he came to Bombay, and a serious student, always taking down notes and preparing questions which he discussed with Ustad Saheb whenever the Master was free. In deference to the wishes of the Abed Sahebs, Bahmanshah Hakim left Surat and his beloved Ustad Saheb and came to Bombay in 1917. For a full year, Bahmanshah stayed with Dr. Framroze, accompanying him to his Bhuleshwar eye clinic and from there to the hospital at Dadar where he practiced. In this period, Dr. Framroze taught Bahmanshah the basics of human anatomy and physical medicine. In addition, he took Bahmanshah to the Grant Medical College where he had studied, to attend lessons on human anatomy and dissection, which gave Bahmanshah a very firm background on which to build his practice of traditional medicine. Through these days of studies, Bahmanshah kept up his prayer routine and strict Tarikat way of life. As his days in Bombay were drawing to a close, Bahmanshah was instructed by the Abed Sahebs to give a particular name of the 101 names of Ahura Mazda to Dr. Framroze, along with instructions on how to pray it a certain number of times for a specific number of days keeping certain precautions in mind. Bahmanshah Hakim gave these instructions of the Abed Sahebs to Dr. Framroze and earnestly requested him to follow the same and witness some amazing changes in his life, as had happened with himself many years ago. Dr. Framroze started the amal of this name, but around the same time, his wife Najamai, fell seriously ill and in the attendant confusion, Doctor Saheb missed out on his amal. Even though Dr. Framroze did not discuss this failure with Bahmanshah, the Abed Sahebs informed Bahmanshah of this lapse and requested him to tell Dr. Framroze to restart the amal at the earliest! In this manner, at the insistence of Bahmanshah, Dr. Framroze restarted the amal and successfully completed the same. At the end of this exercise, Dr. Framroze realized that his ability to read and understand Khshnoom had expanded to a great extent. If he had a query on a specific topic, his hands would instinctively open a page of a book where the answer would be found. If the query persisted, some stranger would engage in a conversation and lead him to his answer. When Ustad Saheb spoke in public, Dr. Framroze would get the real deep meaning of what the Master was trying to convey. In this manner, Dr. Framroze began taking and making exhaustive notes on the difficult topics of Khshnoom, discussing them with the Master whenever he came to Bombay. One of the most difficult and deep chapters in the science of Khshnoom is the topic of Bundahisn or Cosmo-genesis – the beginning of creation. This topic is very convoluted and can take years of study to get even a very basic grasp. In his public talks, Ustad Saheb would give some glimpses of this difficult topic and then move on. Dr. Framroze began taking notes on this topic and over a period of more than six months, prepared a draft essay on the topic. One day as Dr. Framroze sat at the feet of the Master, discussing some matter, he very politely brought up the topic of Cosmo-genesis and revealed to Ustad Saheb that he had prepared an essay on the same and would like to read it out to the Master. Ustad Saheb immediately agreed. Both sat down and Dr. Framroze took out his notebook filled with months of study and effort and read out the essay to the Master. When it was over, Dr. Framroze looked up to see the Master’s reaction. Ustad Saheb merely said: “Ai tamaaru lakhelu badhu faadi naakho!” (Please tear up whatever you have written!) Without a murmur or a sound of protest or any feelings of dismay or dejection, Dr. Framroze tore up those hundreds of sheets of paper there and then. Then the Master told him: “Ave fari thi lakhi laavo!” (Now write it down all over again!) Dr. Framroze went back and began to rewrite the essay. As he began writing, a strange sensation came over him. Dr. Framroze realized that the topic had become much clearer in his mind and he could write with much ease and greater clarity. What had earlier taken him months, was done in a few days time. Once again, Dr. Framroze took his manuscript to Ustad Saheb and read it out. The Master listened and said: “It is very close to being correct. Tear it up and write it again!” Dr. Framroze tore up the manuscript and began his third try. This time the matter became so clear he could actually visualize the steps of creation and his essay was over very fast and read much better and clearer. This time when he went to the Master with the manuscript and read out the essay, Ustad Saheb said: “yes, now it is correct. Keep this with you, and when the time is ripe, you will be able to publish it.” My dear readers, I am trying to convey to you the depth of the science of Khshnoom and the great humility of Dr. Saheb Framroze in front of his Master! In this way Ustad Saheb realized that Dr. Framroze was improving with leaps and bounds. With his spiritual powers, Ustad Saheb became sure that Dr. Framroze was using some Nirang. He asked the Doctor about it and Dr. Framroze admitted that he had been asked to pray the Nirang by Bahmanshah Hakim. Ustad Saheb was very pleased with this development and gave Dr. Framroze some further guidance on how to pray in order to make the Nirang even more powerful and effective. In this manner, the bond between Ustad Saheb and Dr. Framroze deepened and strengthened into a great relationship. This was the greatest contribution of Bahmanshah Hakim to the cause of Khshnoom. Struggling with writing beautiful papers? Use custom dissertation writing service! Is it possible to be aquainted with the subject? Ustad saheb’s late grand son was my pt.and friend till his last days. I am a sinior citizen and retired from practice of 46yrs. Thk you for all your efforts……..
Would you be kind enough to tell me where can we find this essay of Dr. Framroze on Bundahisn or Cosmo-genesis – the beginning of creation……….Thank You.